MEXICO CITY (AP) — Archaeologists in Mexico City have unearthed the skulls and other bones of 15 people, most of them the children of traveling merchants during Aztec times. Researcher Alejandra Jasso Pena says they also found ceramic flutes, bowls, incense burners, the remains of a dog that was sacrificed to accompany a child in the afterlife and other artifacts of a pre-Columbian civilization. Jasso Pena said Friday that construction was about to start on five buildings in a Mexico City neighborhood when the National Institute of Anthropology and History asked to carry out an excavation of the site first. Experts suspected the site was an important ceremonial center for the Tepanec tribe between 1200 and 1300. The influential traders living there were called Pochtecas. Archaeologists say excavation is continuing at the site. It’s this kind of thing, which happens all the time in Mexico, that makes you want to understand who the Aztecs were, how they created this empire, built amazing pyramids, the remnants of which are found today in the cornerstones of museums, between rail lines at metro stops and most importantly under the concrete sidewalk next to the Metropolitan Cathedral. 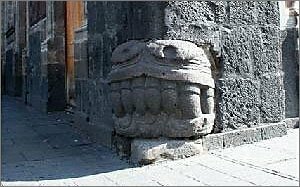 For it was there in 1978 that two city electrical workers jackhammering for the metro made one of archeology’s most significant finds: the ceremonial stone depicting the Aztec moon goddess, Coyolxauhqui, which led to the excavation of the Temple Mayor, the Aztec pyramid Cortez thought he’d buried forever. Tenochitlan, now present day Mexico City, grew up in the areas around lake Texcoco around 1300. 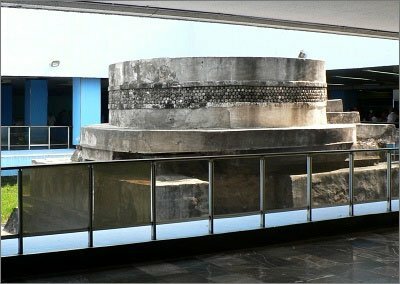 By the time Cortez landed in Veracruz in 1519, it was one of the most intellectually, artistically developed and wealthiest empires ever to have existed in Mesoamerica. And when we saw all those cities and villages built in the water, and other great towns on dry land, and that straight and level causeway leading to Mexico [i.e. Tenochtitlán], we were astounded. These great towns and cues [i.e., temples] and buildings rising from the water, all made of stone, seemed like an enchanted vision from the tale of Amadis. Indeed, some of our soldiers asked whether it was not all a dream. It is not surprising therefore that I should write in this vein. It was all so wonderful that I do not know how to describe this first glimpse of things never heard of, seen or dreamed of before . . .
And when we entered the city of Iztapalapa, the sight of the palaces in which they lodged us! They were very spacious and well built, of magnificent stone, cedar wood, and the wood of other sweet-smelling trees, with great rooms and courts, which were a wonderful sight, and all covered with awnings of woven cotton. Well, I would not say nothing. Much of it is there waiting to be unearthered. And about those traveling merchants . 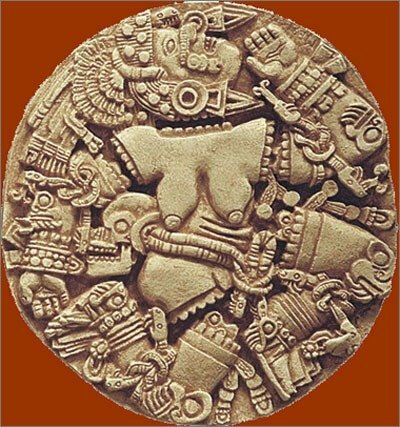 . . along with jade and quetzal feathers, they also traded in chocolate. 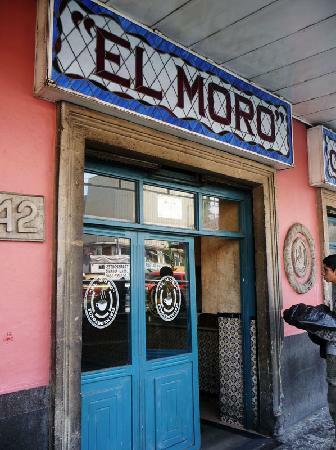 When you are in Mexico City, you must go to El Moro for a cup of hot chocolate—they have four different kinds— and a churro. Rick Bayless just created a little restaurant in Chicago–XOCO— which tries to duplicate the hot chocolate of El Moro, just to give you an idea of how good it is. When I’m at home and I want to make this treat, I use Mayordomo bittersweet chocolate that I bring back from Mexico. You can use Abuelita or Ibarra, but the most important thing to use is a molinillo, sort of a wooden whisk, which is used to froth the milk. 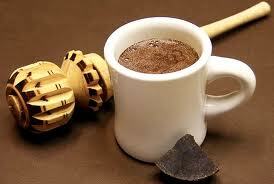 I was told by a cook in Oaxaca that the Mexican believe you are transferring your energy into the drink. Be sure to make this by hand and with love! For that, a blender just won’t do. 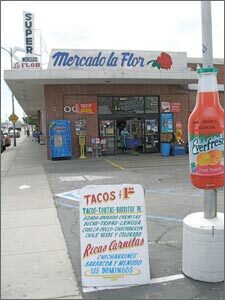 If you live in California, you’re bound to have some little grocery store that looks like the one on the left. 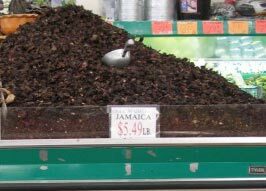 This is my top mercadito for all the special things I need for Mexican cooking— tamarindo, nopales, all kinds of dried chiles and those lovely little dried hibiscus flowers called flores de jamaica in Spanish. 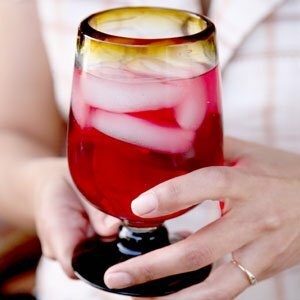 After a cold rainy spring, summer is finally here in the Sierras, and I’m going to give you a great recipe for a drink called agua de jamaica, the perfect tart/sweet refreshment for sipping on hot, dry days with a book in your hand and the fan turning back and forth as you read. The first time I had agua de jamaica was in Oaxaca. 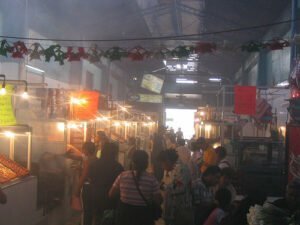 We’d been roaming the markets in the sweltering spring heat. I was looking for an all white huipil and falda from Mitla—the one that Lili wears at the birthday party she throws. The picture on the right even LOOKS hot, doesn’t it? Dave had been a really good sport, lugging my purchases around, but I could tell he was done. When he suggested a drink in the cool of the sheltered patio at the ex-convento de Santa Catalina, now the Camino Real Hotel, I said sure. Well, Dave ordered a beer, but that would have put me to sleep for the rest of the day. I didn’t want the ubiquitous Coca-cola they always offer, so one of the waiters suggested agua de jamaica. It arrived at my table—an amazing garnet red color— in one of those hand-blown glasses that are the color of sea water. On top they’d placed a beautiful peach colored hibiscus flower. If you live in the south where those things grow, you could add that little touch. Anyway, here’s Rick Bayless’s version of this delicious beverage. In a medium non-reactive saucepan, bring 1 1/2 quarts of water to a boil. Add the “Flowers” and sugar. Stir for a minute or so, while the liquid returns to a boil and the sugar dissolves. Cover and let steep for an hour, but no more than two. liquid as possible. Stir in three cups of water and chill in a glass pitcher, one that won’t stain! 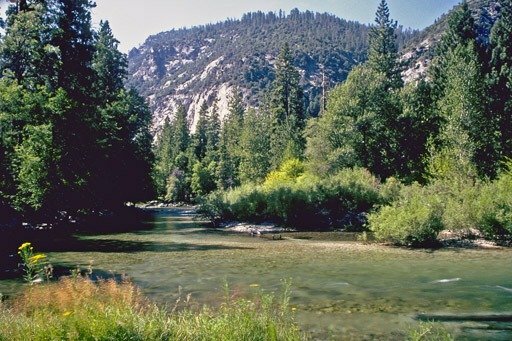 I don’t know where you’ll be when you read this, but I’m going hiking, and, if we can finish all the chores around here, we’re planning to car camp. Yes, by a river. 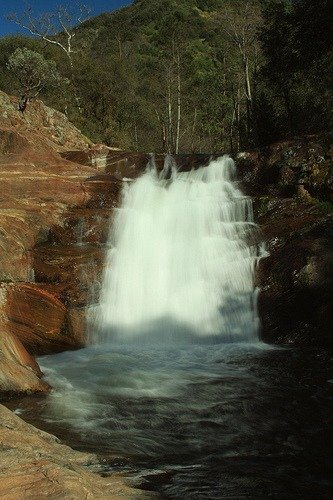 I just want to be sitting on a rock, reading a book, listening to the rush of a waterfall as it tumbles over granite into a blue-green pool. What am I reading? Well, it’s almost summer, and since the book group just hefted Anna Karenina, mentally and physically (Best. Novel. Ever. 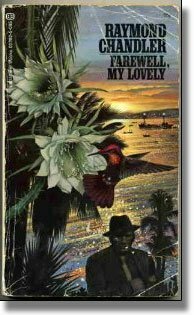 ), we’re reading something lighter, or maybe darker — Farewell My Lovely by Raymond Chandler. But hey — look at what the critics say about it. Anyway, it’ll be a great read on a rock in the sun or by the campsite at night with the light of the kerosene lamp. Can’t wait. And for this expedition, I’m making a great vegetarian chili. Saute onion in vegetable oil until translucent. Add carrot, followed by red pepper and saute until tender but not mushy. Add garlic and saute until fragrant, but do not let it brown. Add the rest of the ingredients EXCEPT vinegar and cayenne. Simmer for fifteen minutes. Add the cooked beans and simmer another ten minutes or so. Taste for salt and heat. Add the cayenne, a small amount at a time, until you reach the level of heat you want. Follow with a splash of vinegar. Sometimes I skip this and serve the chili with a wedge of lime because it’s pretty. Add chopped raw onion, grated cheddar cheese, cilantro, sour cream to the bowls as you like. 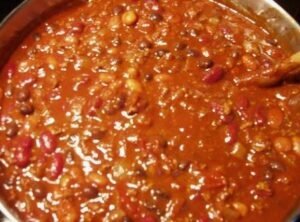 Serve chili with warm flour tortillas and cold beer. So I’ll pack the cooler with the above, plus blue corn pancake mix for breakfast. 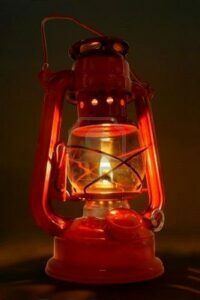 All that’s needed is the red checked tablecloth, a mason jar for some wildflowers and a couple of oil lamps. Plus a table with a view of the King’s River. Just me and my guy. Heaven. Soak beans overnight in 7 cups of water. Discard water. Saute onions in large dutch oven for ten minutes. Let them get a little brown. Add beans and 6 cups of water. Add salt to taste only after the beans are done. I’ve thrown open all the windows. 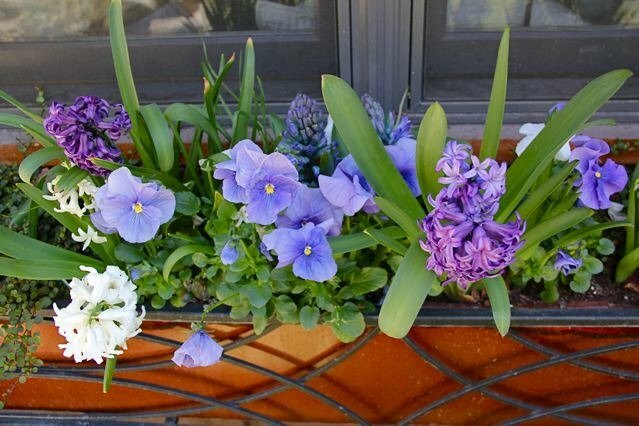 The hyacinths are in full glory in the window boxes, and when the breeze blows, the scent fills the house. When that happens, I simply have to stop what I’m doing and just inhale. Even though my pots of Tulipa Abba are in splendid bloom on the porch, it can still get cold at night. Soup is a great way to take the early spring chill off. I’m giving you a recipe to try for Sopa Tarasca. 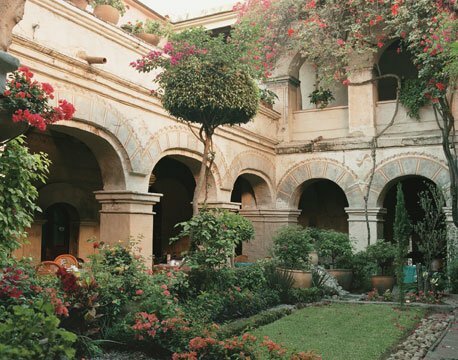 One, it’s the soup I was served on the terrace of the Villa Montana in Morelia the day I started writing this novel. Two, it’s exactly the soup I imagined Fatima serving Lili in Episode Two of Palace of the Blue Butterfly, the one she served in the rustic, clay bowls. Actually, this isn’t my recipe. It belongs to Pati Jinich, the chef on Pati’s Mexican Table, a new cooking show on PBS. This show is just one more reason funds to PBS should not be cut! The music is enough to turn me into a salsera. “Give me your chocolate, give me your sweet, brown sugar, give me hot coffee, give me your heart.” Pretty much sums up the things I want in life right there! So go to Pati’s site, look up soups and then find the blog post “About a soup and a book“. I do have one suggestion though. You’ve got to make your own beans. Period. Canned beans taste like soap and metal. Yuck! Plus there’s the whole BPA thing. I’m sure you could find some great bean recipes from Diana Kennedy. She’s a fascinating woman, and a wonderful cook, really one of the first people to put Mexican cooking on the English speaking map. Sometime I would love to study Mexican cooking with her in Michoacan. She used to give classes in her home. 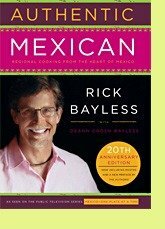 Or, you could check out Rick Bayless’s site. He’s one of my heroes. Dave took me out to dinner at Topolobampo in Chicago once, and it was a super thrill! Anyway, make yourself the soup, grab a cold Corona and a wedge of lime. Pop your earbuds in and listen to Episode Three. Things are about to get way more complicated!